Making my way through Washington Park, along a steep winding road that seemed to go forever, I made my way to the Oregon Zoo. Finally, like an oasis after a long journey there stood a large log cabin in the woods, but this log cabin is the entrance to the Oregon Zoo. Welcoming me into the zoo were a pair of beautiful white Rocky Mountain goats. Their white, fluffy wool coat keeps them warm and helps camouflage them in their snowy environments. Strangely enough, these ‘goats’ are not true goats and are more closely related to antelope. 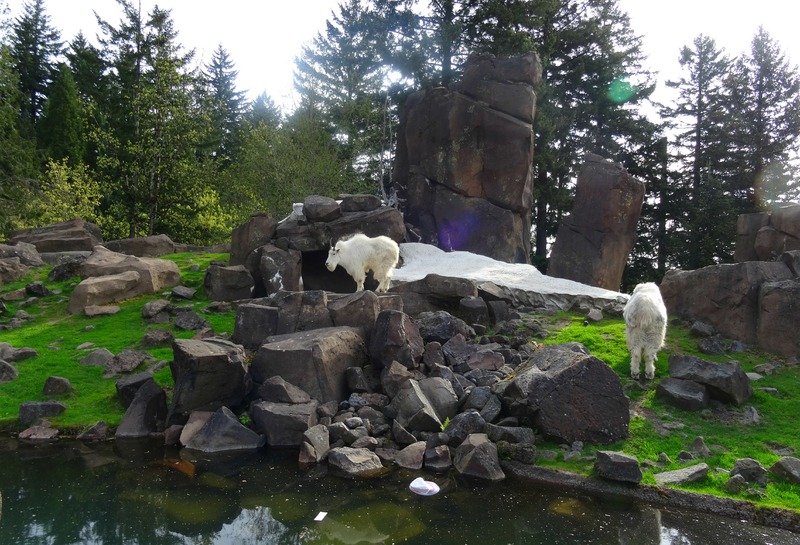 With this first amazing enclosure that replicates the natural ruggedness of the alpine habitat of the Cascade Mountains where these mountain goats are found in the wild, it’s a hint of the fantastic, naturalist enclosures that the Oregon Zoo’s Great Northwest exhibit had to offer. The Great Northwest exhibit is home to species found in and around the US’s northwest and its here you’ll find black bears, beavers, river otters and much more. The elevated pathways throughout offer great viewing of the animals and there’s even a 100 foot suspension bridge taking you through the wondrous forests of Portland’s Washington Park. Surrounded by towering Douglas fir trees and Oregon’s native flowers found along the trails like the tall Oregon grape and the beautiful western trillium. It was here I met a sweet and curious bobcat watching visitors and the Oregon Zoo’s bald eagles that came from wildlife rehabilitation centers with injuries that they received in the wild which sadly left them unable to fly. Here at the zoo they have a large walk through aviary to safely call home with high tree branches to perch on, keeping watch over the pond below full of salmon. This exhibit replicates the Northwest watershed as it encompasses the forest canopy to the waterfalls leading into the stream below. The Great Northwest exhibit is also home to some unique and interesting art pieces from a wall of wooden art with images of animals found in the exhibit called the Cascade Carving to sculptures and waterfalls with artful fish throughout to a beautiful mosaic piece. 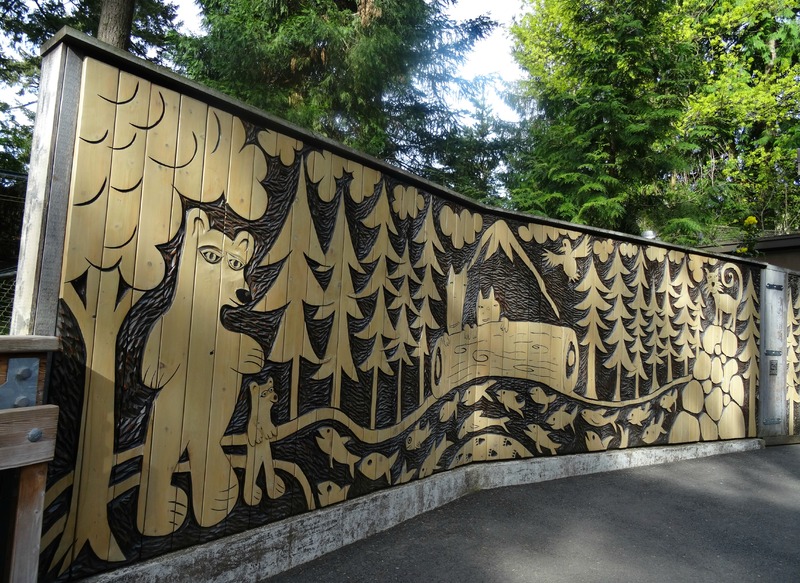 The Cascade Carving (shown above) was drawn by the Youth of Portland and carved by Steve Jensen and brings the pure, innocence of a child’s view of nature to life. From beautiful art to beautiful birds, the Oregon Zoo is home to a great diversity of native and exotic birds. In the Great Northwest exhibit there lays a picturesque pond that’s home to some gorgeous waterfowl like the Cinnamon teal and wood ducks. To me the most striking of them is the bufflehead with its stunning contrasting black and white features. Buffleheads are monogamous and build their nest every year in the same spot, a cavity in a tree that was most likely made by another animal like a woodpecker. 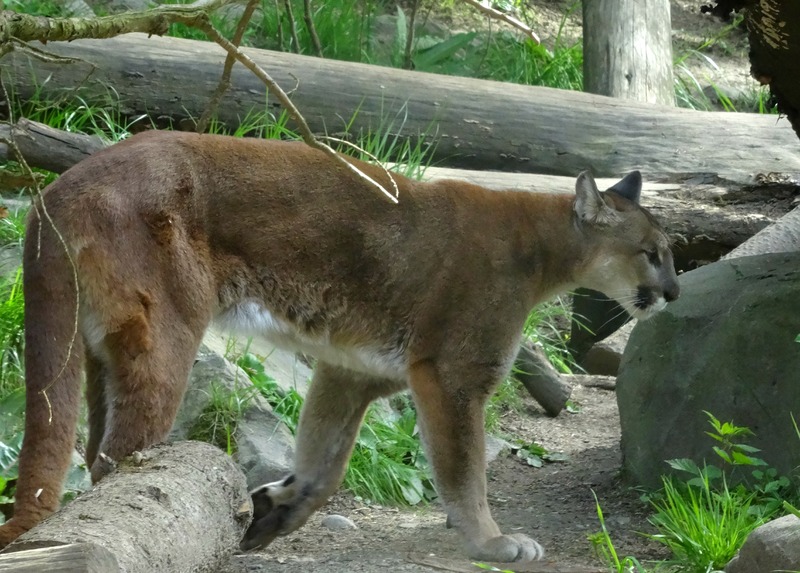 Further along prowling around a large naturalist enclosure full of trees, rocks and plenty of places to hide was an awesome cougar with its golden coat of which their name come from. Though they’re called everything from mountain lion to panther and holds the record for the highest number of names of any animal with over 40 in English alone, their scientific name Puma concolor is derived from Latin, concolor meaning “of uniform colour” referring to its coat. The last and newest enclosure in the Great Northwest exhibit is the Condors of the Columbia which coincided with my visit in the spring of 2014. Here you’ll see the majestic California condors that are native to the Northwest but sadly hadn’t graced the skies for over a 100 years but now, with the help of the Oregon Zoo, are now being released to soar again. If there is one thing I realized after touring the Great Northwest exhibit of the Oregon Zoo it was that the astounding, naturalist enclosures that I encountered in this first exhibit was only the beginning and I knew this was going to be a fantastic day of exploring a truly great zoo! Thank you, you’re too sweet!